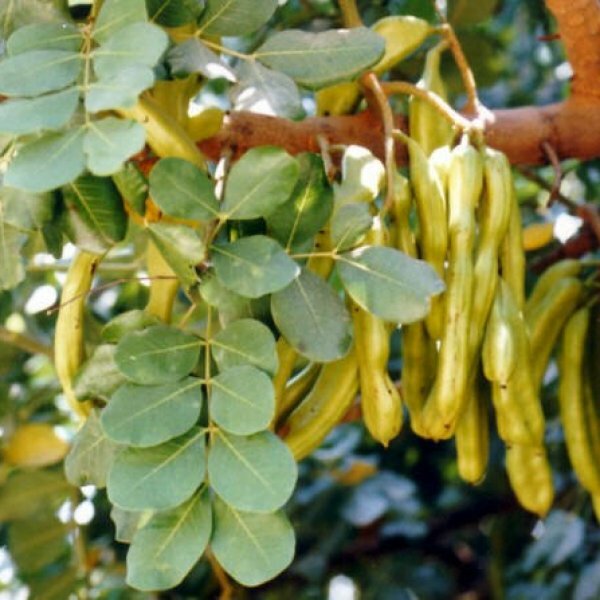 The carob tree offers deep shade for warm, dry climates. It is native to the eastern Mediterranean where winters are mild and wet and succeeded by a very long, dry season. Adapted to poor, rocky ground that is well drained, it solves a landscaping challenge in the sandy-gravelly soils of desert gardens. This is a medium-sized evergreen tree with dense branching and large, glossy, leathery leaves. 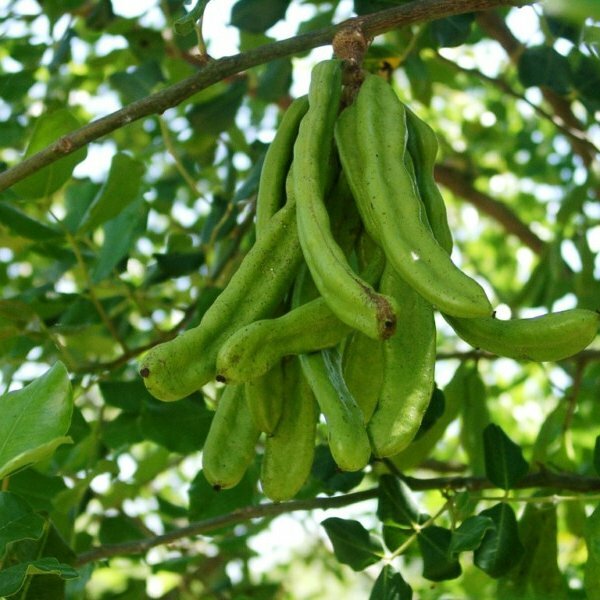 The Carob tree blooms in spring with small flowers that release a pungent scent. They are followed by thick, brown, hand-length pods that are highly nutritious, hence the common name, St. John’s bread. The sweet pods are the source of culinary carob. 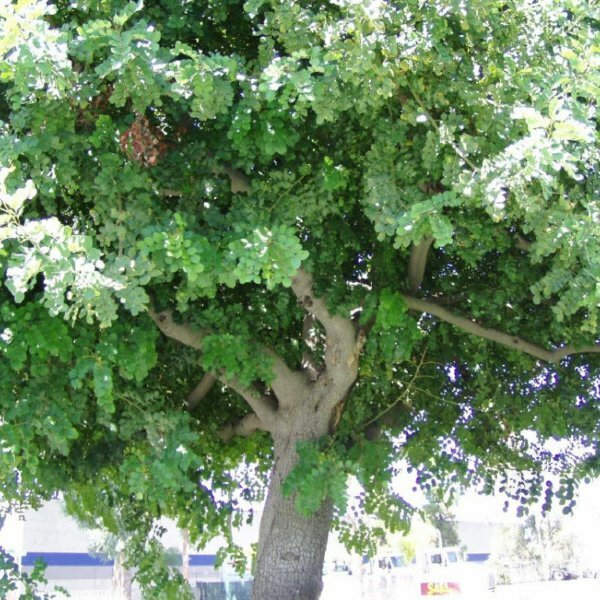 The roots of carob trees are avid water-seekers and problematic in close quarters with sewer lines, buildings and paving. The tree is often overlooked because of the unpleasant flower scent and the pod litter, but beauty and drought resistance recommend it in dryland gardens. It has proven to be a good park and parking lot tree, and in open space it offers considerable habitat value. Use as a standard shade tree, a multi-trunk accent or massed and trimmed as a hedge or screen. Requires a very sunny position in any well-drained moderately fertile soil. Does well in calcareous, gravelly or rocky soils. Tolerates salt laden air. Tolerates a pH in the range 6.2 to 8.6. The tree is very drought resistant, thriving even under arid conditions, the roots penetrating deep into the soil to find moisture. Once established, carob trees require little nutrition and will thrive without additional fertilizers. Germination 1. Rub carob seeds between two pieces of sand paper or nick the surface with a sharp knife. Place the seeds in a bowl of water until they swell (up to 3 days) to about three times their previous size. 2. Fill a deep pot with sterile seed-starting medium such as vermiculite or a sterile, soil-less premixed formula designed for seed germination. Use a pot that has several drainage holes in the bottom. 3. Make a 3-5 cm deep hole in the center of the pot. Drop the seed into the hole and cover it with 2 inches of potting mix. Plant seeds in the fall or spring. Keep them in a greenhouse for the first year. Keep the soil damp but not saturated during germination and first year of growth. Germinates best at +22-+26C soil temperature. 4. 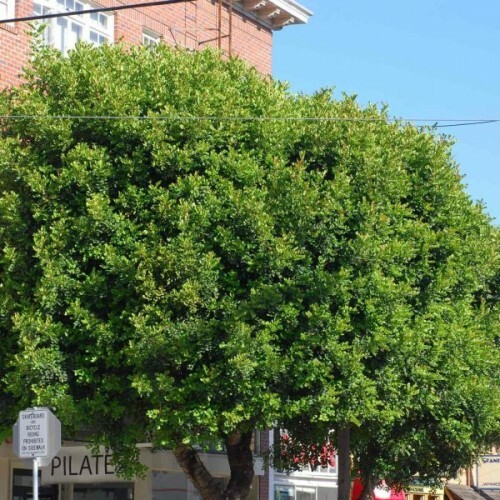 Transplant the carob sapling outside to a permanent position if the climate is suitable. Transplant in the the spring, one year after germination. In colder areas, transplant the seeds into a deep pot. Keep the tree in a greenhouse or protected area during the winter. Use a pot that is at least 1.20 m deep to accommodate the long tap root. 5. Keep the soil damp around the sapling for the first year. In hot dry weather, water daily or every other day. In cool damp weather, watering may be not be necessary. Apply water when the top 5-8 cm of soil feels dry. Mature trees need water only in severe drought.